Dolphin Gold Stellar Jackpots is 5 reel and 40 pay lines online slots game based on the underwater sea with a majestic view of the aquarium-like setup. The cool blue waters in the background with colorful corals and bubbles rising up look very fascinating. Sounds effects and music track during each spin adds more glory to the game and every big win is presented to you with a cheerful music. 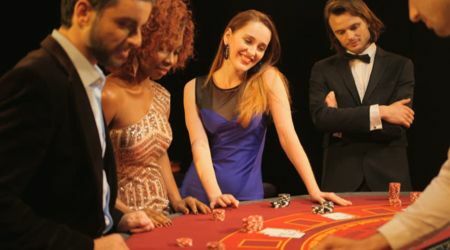 You can place your bets with amount start from £0.48 and increase your stakes all the way to £60 per spin. There is a jackpot game called Stellar Jackpots that offers you mini, minor and major rewards that go up to £50,000. This wonderful online slots game was developed by NYX (Lightening Box), an online casino based developers who have produced hundreds of popular slot games that can be played on various devices such as computers, mobiles, and tablets. They offer unique bonus features in all their games from which you can win huge stakes of money. This online slots game is played with various sea creature symbols such as electric ray fish, color striped fishes, sea turtle, seahorse, and corals. The top value symbol that pays highest stakes of 500 times is the electric ray. It also pays 1000 times when five wild symbols substitute for this top symbol. There are five low-value playing cards symbols from 9 to K, J, Q & K pays you 50 times and 9 & 10 pays 25 times your stake when five of each symbol appears on a payline respectively. Stellar Jackpots Level: This is the jackpot round of this online slots game and the triggering of this game is just random and does not depend on your bet amount or any other condition. This has 6 ‘pick and wins’ sublevels where you need to choose a random symbol from the group. If you win then you progress to next level and if you get an ‘X’ then you will lose a life. There are 3 lives offered in this jackpot and 3 times ‘X’ ends the game. Wild & Scatter: The blue dolphin is both wild as well as scatter feature of this online slots game. It appears only on reels 2, 3 & 4 and covers for all except the gold dolphin symbol. Up to five symbols, blue dolphin acts as a wild and mostly appears in stacked formation. From six appearances onwards it turns into scatter offering free spins. When it comes to an online slots game with the highest number of free spins, this game tops the list as can win up to 21 free spins which can be re-triggered during free games. This means, a better chance of winning huge stakes of money.